What I can’t get my head around is why would you give a tabloid hacking enquiry to the Counter Terrorism police? 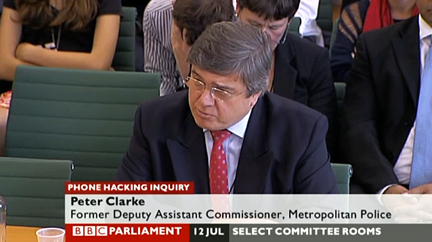 Commander Peter Clarke, before the Home Affairs Select Committee, told us that his department was given the job because the victims were the Royal Family and they need to be protected from terrorist threat. But they knew at this early stage that this was the press dealing in tittle-tattle, not Islamists plotting to kill the Queen. There are a huge number of different squads at Scotland Yard and elsewhere. Why didn’t this case go to the police who specialise in computer misuse and fraud? So get this. Andy Coulson was given the very highest security clearance when he was appointed Head of Communications for Downing Street. That means every that every state secret, every military secret, all espionage and terrorism secrets, and every secret about how the spooks gather those secrets. This man was given a level of security clearance equal to the Prime Minister, Home Secretary and the Queen. But it’s worse than that. Ask yourself who is our greatest ally, in terms of military, espionage and terrorism. The United States of America. What is the level of security clearance that the American government shares with the British government? Just about the highest level of clearance that it would be possible for a foreign ally to have. The British have near total clearance of American state secrets. Therefore, Andy Coulson was given, by David Cameron, near total clearance for American state secrets. The biggest mistake Ed Miliband ever made was his failure to recognise the value of a good nick name. On day one the media called him Red Ed, but he was so desperate not to be seen as too socialist that he successfully managed to shake off the moniker. This was a stupid mistake, because he didn’t have another one to replace it with. Ken Livingstone, in the 80s, used to be brilliant and kicking up a storm and getting the press to write hate pieces about him. But Ken also knew that when he went on TV and spoke, the same people who’d read about him as a crazy communist would find that actually he’s a perfectly intelligent and articulate young man with lots to say about London. That’s how he used to win people over. That’s what made him unbeatable back then. The great thing about having a moniker is that it gets you noticed and gives the journalists an angle to write about you. You get a ten times as much press if they’ve given you an identity, especially if you play up to it and use it, rather than it using you. It would be wonderful to only have a moniker that was flattering, but it’s not about flattery, it’s about identity, standing out from the crowd. The “Iron Lady” originated as an insult by the Russians. It didn’t fit Mrs Thatcher’s image as a sensible housewife, running the country like she runs her household, but she immediately grabbed hold of it, knowing the value of these things. To be a good political leader, you need to be driven by something; you need to want attention for yourself. You need to be a tad exhibitionist, or a performer. Watch this clip of Margaret Thatcher with her feather duster at the 1975 Tory Party conference? She wasn’t offended when the press described her as a housewife; she joked about it, but was also able to then switch to giving a very serious message about the freedom of the individual. I remember delivering a leaflet of Gordon Brown surrounded by children, with his arms open wide and looking up to the camera with a beaming smile. It was so obviously Photoshoped. I remember thinking that Gordon would be much better off playing to his real image of being quite difficult grumpy man, but full of passion and very intelligent. The equal of the Thatcher film would be Gordon making his conference speech and stopping for a moment to throw some joke mobile phones at his staff. It would have endeared him to the public and would cause people to listen to his serious points, like in the Thatcher film above. When Ed Miliband was given the nick name Red Ed, he didn’t make a joke about it or enjoy it, he did everything in his power to get rid of it. People in the south aren’t that bothered about whether a politician is left-wing or right-wing, as long as the right-wing one isn’t planning to privatise the NHS, and the left-wing one isn’t planning on bankrupting the country. What people in the south want is a politician who has a clear idea of what he or she stands for. Also, they want someone who is on their side. 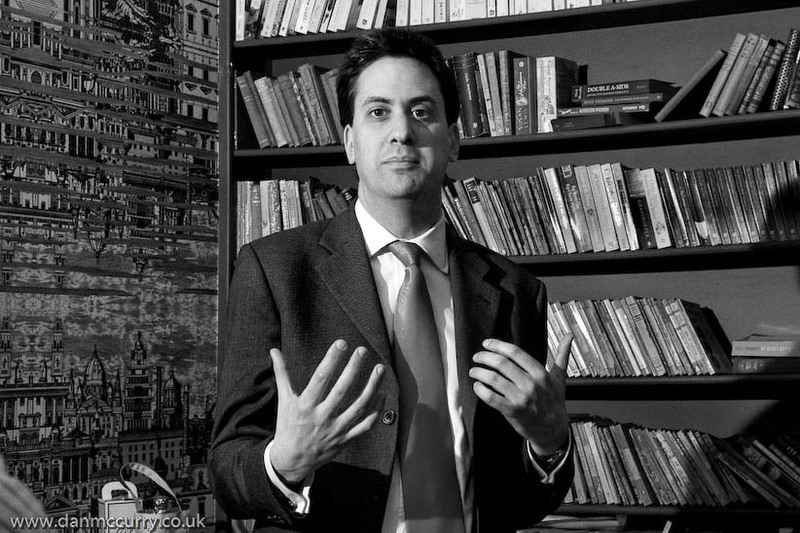 When people worry about their jobs, at least Red Ed would know what it feels like. When people worry about paying the bills, at least Red Ed cares. But what about this chap from North London, who likes to play pool, and who beat his brother to the Labour leadership, does he care? Does he know what it feels like? Or is he one of those think tank types? Is he irrelevant? If he’d enjoyed the Red Ed tag and decided to run with it, it would have provided perfect cover for a lengthy policy discussion. If he’d said anything left-wing, they’d believe he was genuine, while on more right-wing policies, they’d see that Red Ed is pragmatic, and they’d respect him for it. It was a win-win situation. As it is, he didn’t like the image, but he didn’t have an alternative image to offer. The result is that the people seem to be making up their minds that Ed doesn’t much care, that he doesn’t know what he wants, that he is not on anyone’s side for fear of being labelled as one thing or another. In his effort to please everyone, he ends up pleasing no one. The people are beginning to form a settled view that Labour is irrelevant. What a shame. Most politicians would give their right arm to have a nick name that trips off the tongue, and is recognised by the whole country. The Labour leader did everything he could to be anonymous. And that was the biggest mistake he ever made. You are currently browsing the McCurry's Weblog blog archives for July, 2011.